Deciding what cruise itinerary to book is one thing, but choosing a cabin is a whole other matter! Today’s cruise ships can offer up to 20 different categories which can be incredibly overwhelming for first time cruisers. To help you wrap your head around what’s on offer, we’ve put together a guide covering everything you need to know about choosing a cruise cabin. At the end of the day, cabin choices boil down to four major categories – inside (with no view), outside (with ocean views through a window), balcony/verandah (featuring a private outdoor space) and suites (large and luxurious!). Size can vary quite significantly between cabins. When booking the cruise line will usually list the cabin’s size in square feet which will give you a good idea of what to expect. 120 square feet is cosy and compact while 250 square feet offers plenty of room to move. When booking a cabin it’s important to think about your cruising companions. If you’re sailing with a partner make sure you secure a cabin with double bed as some two person rooms feature two singles which can be a bit of a killjoy for honeymooners! 4 berth rooms are ideal for groups of friends while family suites and adjoining cabins are ideal for those travelling with kids. 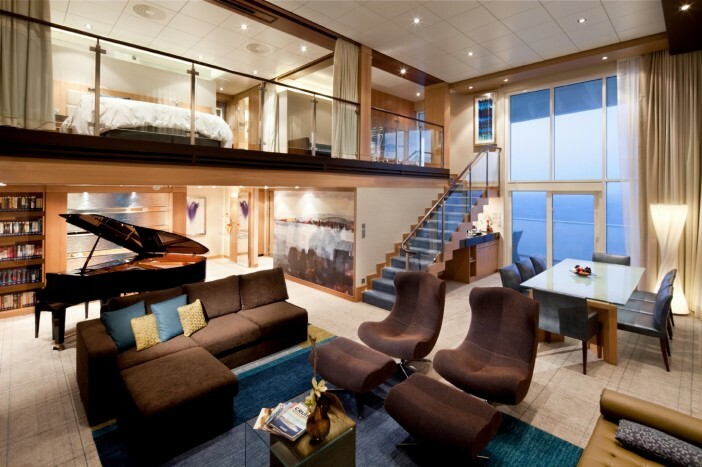 For solo sailors, some ships also offer singles cabins. Location can have a huge impact on your overall cruising experience. Those suffering from sea sickness should opt for accommodation on the lower decks while light sleepers should request to be housed away from stairwells, theatres and nightclubs. In general, the more you pay the better your in-cabin amenities. Some high end accommodation options feature extravagant luxuries such as flat screen TVs, Jacuzzis and even baby grand pianos! Want to snap up a great deal on the cabin of your dreams? Cruise 1st has some amazing cruise accommodation deals on everything from budget friendly inside rooms to ultra-luxurious multi-level suites.